Pangolins are insectivorous mammals confined to the Afro-tropical and Indo-Malayan regions. They are also known as “Scaly Anteaters” because of their structure and food habits. These burrowing mammals predominantly feed on termites and ants. Pangolins are unique with a body covered with tough, overlapping scales. In presence of a danger, pangolins quickly roll themselves up into a tight ball. In fact, the name “pangolin” is derived from Malayan phrase “Pen Gulling” meaning the “rolling ball”, owing to this particular behavior. Pangolins are solitary, nocturnal creatures, and are known to be good climbers. Pangolin limbs are stout and well adapted for digging. Each paw has five toes, and their forefeet have three long, curved, claws used to demolish the nests of termites and ants and to dig nesting and sleeping burrows. Pangolins shuffle on all four limbs, balancing on the outer edges of their forefeet and tucking their fore claws underneath as they walk. With small conical heads and jaws lacking teeth, pangolins have amazingly long, muscular, and sticky tongues that are perfect for reaching and lapping up ants and termites in deep cavities. Pangolins have poor vision, so they locate termite and ant nests with their strong sense of smell. A pangolin’s tongue is attached near its pelvis and last pair of ribs, and when fully extended is longer than the animal’s head and body. At rest a pangolin’s tongue retracts into a sheath in its chest cavity. There are eight pangolin species in the world. 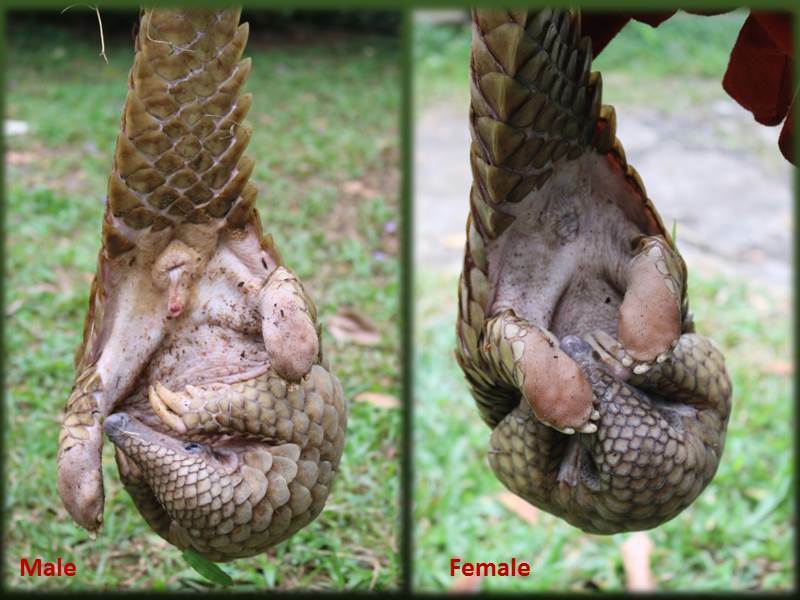 Based on their distribution they are categorized as Asian and African pangolins. Four species are occurred in Asia and four are in Africa. Chinese pangolin (Manis pentadactyla), Sunda pangolin (Manis javanica), Indian pangolin (Manis crassicaudata) and Philippine pangolin (Manis culionensis) are the four Asian species and Cape or Temminck’s Ground pangolin (Smutsia temminckii), White-bellied or Tree pangolin (Phataginus tricuspis), Giant Ground pangolin (Smutsia gigantea) and Black-bellied or Long-tailed pangolin (Phataginus tetradactyla) are the African pangolin species. The Asian pangolins are distinguished from the African counterparts by the presence of bristles which emerge from between the scales. 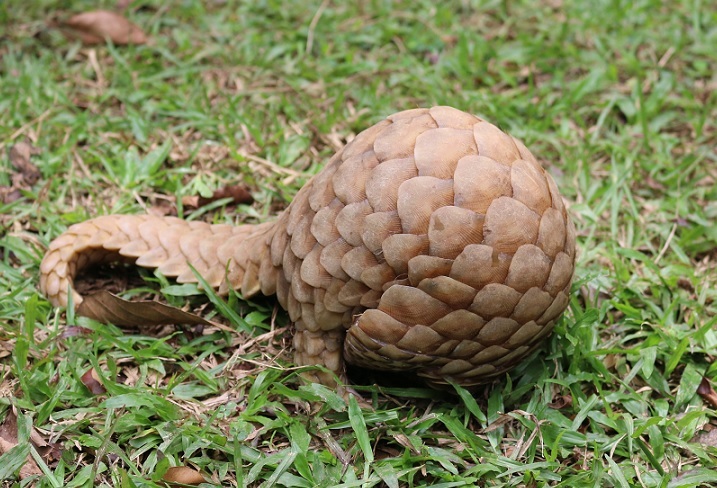 Also known as the thick-tailed pangolin, M. crassicaudata is a distinctive animal that has an elongated tapering body, covered with large overlapping scales (11- 13 around the body) which act like armour plates, except on snout, chin, sides of face, throat, belly and inner surface of limbs. These moveable scales are shed periodically. Scales may be regarded as hairs or rather as spines enormously enlarged and flattened. However, there are some thin, long, light-coloured hairs present in the bare parts. The shape and topography of scales change with wear and tear. Colour varies from different shades of brown to yellow, often depends on the colour of the earth of its den. Indian pangolin (Manis crassicaudata) occurs in South Asia from parts of eastern Pakistan through much of India (excluding north-eastern portions) south of the Himalayas and Sri Lanka. In Sri Lanka, M. crassicaudata is the solitary species belonging to Order Pholidota. It has achieved a significance cultural value and it has been recorded throughout the lowlands, up to 1,100 msl, often coinciding with the range of termites. It has been recorded in different types of tropical forests, mainly moist, dry deciduous, wet to semi-evergreen, thorn as well as grasslands. Though terrestrial in habit, Indian pangolins are excellent climbers, using caterpillar locomotion, with the firm grip of forefeet on the tree. The tail provides auxiliary support. The pangolins are highly specialized in their feeding habits. They feed mainly on eggs, young ones and adults of termites and ants by digging the termite or ant nests. Before digging the termite or ant nests, they utilize their sense organs, smell rapidly around the area to select the most suitable spot to start with and feed rapidly by extending protrusible, long, thin, tongue into the galleries of nests. Due to absence of teeth, food is directly taken into the stomach and grinded with the help of strong musculature and pebbles collected during feeding. The Indian pangolin was found to use living burrows and feeding burrows; living burrows for sleeping and resting purposes during day time. By comparison of the total number of inactive and active living burrows, they observed that the Indian pangolin usually abandons its living burrows after few months and digs new one close to the availability of prey species, however, re-shifting to the older living burrow is also possible. Pangolins are timid and inoffensive. For defence, they tackle their head towards belly and curl up under the broad scaly tail so that all the vulnerable parts of the body are protected. Male and female are found to occupy the same burrow with the young but very little is known about the breeding habits. Gestation periods range from 65-70 days. Usually one offspring is born at a time. Pangolin mothers nurture their young in nesting burrows. A mother will protectively roll around her baby when sleeping or if threatened. Babies nurse for three to four months, but can eat termites and ants at one month. At that time the infant begins to accompany the mother outside of the burrow, riding on the base of her tail as she forages for insects.